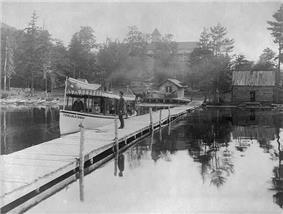 Blue Mountain Lake is a rural hamlet in the Town of Indian Lake of Hamilton County, New York located at the intersection of New York Routes 28 and 30. 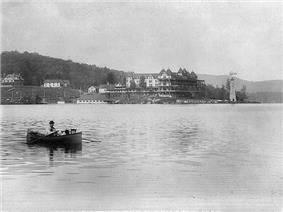 Blue Mountain Lake also refers to the lake on the banks of which the hamlet is situated. Blue Mountain Lake is about 90 miles (140 km) north of Utica, New York and about 90 miles (140 km) northwest from Albany, New York. The place is named after the mountain peak, Blue Mountain. The principal outdoor attractions include camping, boating and hiking supported by the several guest lodges in the area - at least one of which features and actively promotes the absence of televisions, telephones and radios in their rooms. 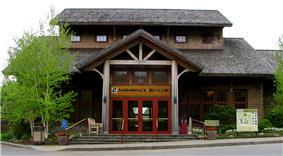 The Adirondack Museum is located just outside the hamlet of Blue Mountain Lake within walking distance east on Route 30. The Adirondack Lakes Center for the Arts provides year round theatre and music performances, art galleries, workshops and classes.